Yup, we totally have to agree with the above words which was taken from Metallica's one of the smashing hit song of 2008 "Broken, Beat & Scarred". Despite the utterly devastating earthquake of April 2015, Nepal's capital Kathmandu was successful to be listed as the world's best tourist destinations. 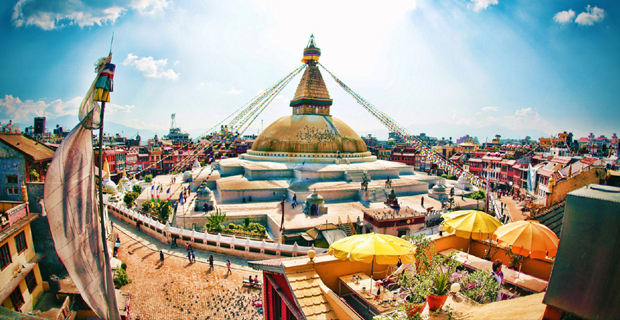 On the list arranged by one of the world's largest travel website TripAdvisor, Kathmandu ranked at 23rd position. This list was published in the Travelers Choice > Destination Section of TripAdvisor. Ranking was performed on basis of the reviews and ratings of travelers all around the world. On April 25, 2015 a 7.8 magnitude earthquake ravaged Nepal. Many of the Kathmandu Valley's historic monuments, temples and buildings were either completely wrecked or damaged. Kathmandu which was once known as city of temples lost many of its historic temples because of this incident. But still it was able to impress the hearts of millions of visitors all across the globe. Tourists who have visited Kathmandu have recommended it for visit describing Kathmandu as one of the best travel destinations of the world. They have illustrated Kathmandu as a beautiful valley full of historic sites, ancient temples, shrines, and fascinating villages. 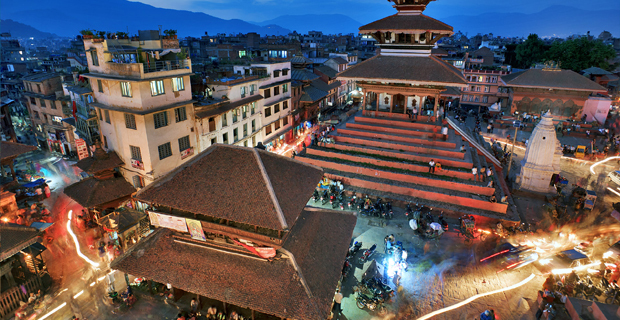 According to TripAdvisor the main attractions of the Kathmandu includes things like hiking in the neighboring local market, sunrise and sunset seen from the neighboring hills, excursion of the World Heritage Sites which are enlisted in UNESCO (United Nations Educational, Scientific and Cultural Organization). 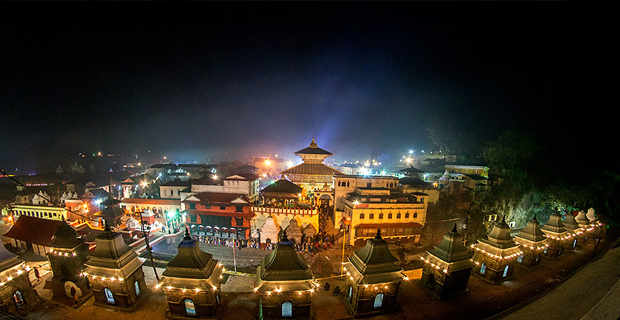 TripAdvisor mentions exploring around World Heritage Site of Bhaktapur Durbar Square, Patan Durbar Square, Basantapur Durbar Square, Pashupatinath Temple, Swayambhunath and Bouddhanath Stupas is one of the most fascinating and intriguing things to do in Kathmandu. 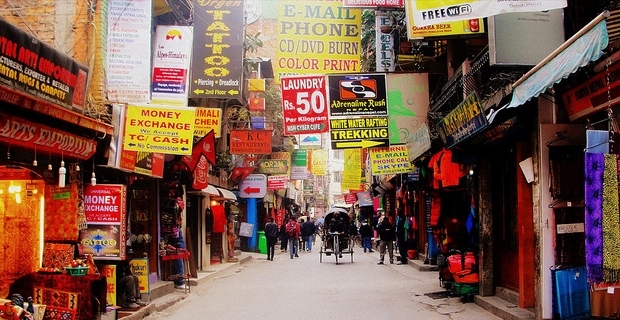 Besides these, TripAdvisor has praised Kathmandu for many aspects. Favorable and suitable climatic conditions and weather, occasional view of Himalayas from valley, handicrafts and artworks, and gateway to explore other beautiful places of Nepal etc where some of the things that were mentioned by TripAdvisor. 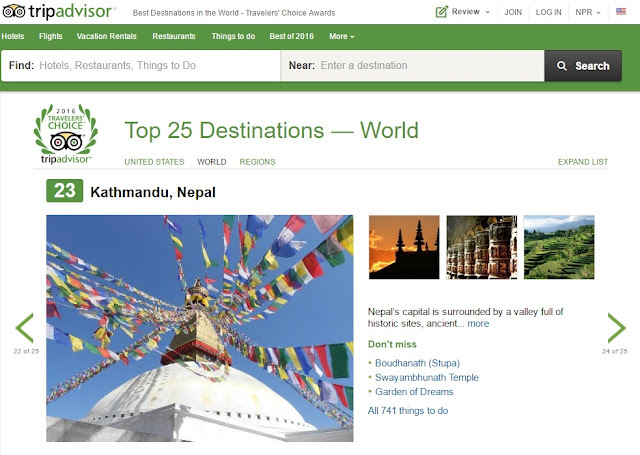 TripAdvisor also stated that visitors can enjoy the Bungee Jumping, Trekking, Rock Climbing, Canyoning, Paragliding, Mountain Flight and other adventure activities in the surrounding areas of the Kathmandu.